A VERY SPECIAL DAY FOR SUPERSTAR RAJINIKANTH! Superstar Rajinikanth celebrates his 36th wedding anniversary with his wife Latha Rajinikanth today (26th February). The couple got married on this same day in the year 1981, at Tirupathi. The couple has two talented daughters, Aishwarya and Soundarya, who are currently busy with their respective directorial ventures. Rajinikanth is shooting for Shankar’s 2.0, while Latha Rajinikanth takes care of their educational institution, “The Ashram”. Sad: Vaikom Vijayalakshmi marriage called off! Breaking: What role does GV Prakash and Jyothika play in Bala's film? Amitabh, Tapsee and the Pink team meet the President! Popular theatre in Chennai to reopen for Ajith's Vivegam! 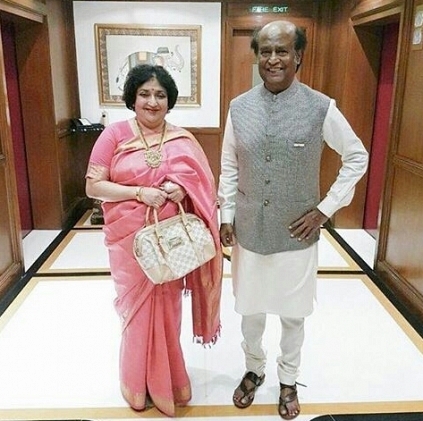 Latha Rajinikanth's Special Gift For The Superstar ! People looking for online information on Latha Rajinikanth, Rajinikanth will find this news story useful.